Sinéad is a solicitor in the Commercial & Business team in Hayes solicitors. Sinéad specialises in commercial litigation and dispute resolution and acts for a variety of companies, financial institutions, state bodies and individuals in contract, enforcement and recovery actions, insolvency and general commercial litigation matters. Sinéad also advises clients on a diverse range of commercial matters and regulatory requirements including data protection, product liability, advertising and promotions and intellectual property. Sinéad was awarded the joint first prize for Ethics in the Law Society’s Professional Practice Course. 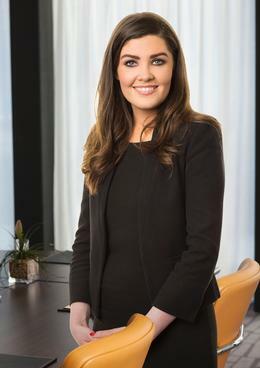 Sinéad qualified as a solicitor in 2017. Personal Injury - Sinéad has been involved in a number of personal injury cases, both defending and prosecuting, in the areas of employers’ liability, public liability and road traffic. Professional Negligence - Sinéad has assisted in defending numerous professional negligence actions involving solicitors and accountants before the High Court. Debt Proceedings - Sinéad advises clients in relation to debt recovery proceedings before the District Court, Circuit Court and High Court. Defamation - Sinéad has assisted in defending numerous high value defamation cases before the High Court. International - Sinéad has extensive experience with commercial litigation in Australia, having assisted in the defence of numerous class actions concerning bushfire litigation.